After months of research and writing for her second book, Sandra Hempel came close to abandoning her latest book, The Inheritor's Powder, in despair. The project seemed to be jinxed. Here she explains the setbacks she encountered while trying to bring to life a major advance in how poisoners were brought to book in the 19th century. The author's tale of woe eventually had a happy ending... unlike some of the characters in this extraordinary true-life murder mystery. My agent had been encouraging enough about the original idea. My first book, The Medical Detective, uses the story of Dr John Snow in order to look at the struggle to understand the great cholera epidemics that hit Britain in the 19th century. For this new book, I planned similarly to use the narrative of James Marsh, an untrained but brilliant chemist, as a device, this time to examine criminal arsenic poisoning and the development of forensic toxicology. Arsenic, or more correctly arsenic trioxide, was one of the murderer's favourite weapons in the 19th century. A harmless-looking white powder, tasteless, easily dispersed in food and drink and fatal in tiny doses, it was also cheap and readily available. And with the symptoms resembling those of several common diseases and no modern methods of diagnosis, doctors were working in the dark when it came to identifying cases. 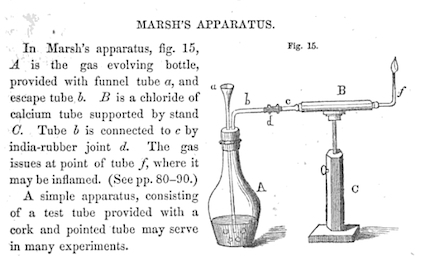 So in 1836 when James March developed a new test for the presence of arsenic that was far more reliable than those currently in use, his work was greeted with huge relief. Now suspect material such as food and stomach contents could be subjected to an accurate analysis. Here was the end of arsenic's long career as a murder weapon, people thought. However, while the Marsh test was indeed a great achievement, it was by no means as simple to run or to interpret as it first seemed. In the 1840s and '50s, some spectacular errors by expert witnesses led the British public to become both worried that innocent men and women were being sent to the gallows on the basis of dodgy science and, at the same time, terrified by a perception that poisoners were everywhere. 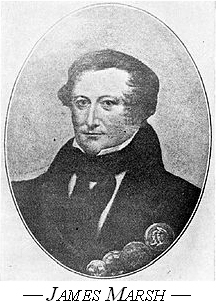 This was a great subject for a book, but the plan to use James Marsh's life and work as the central thread proved impossible. While there is little material about the reclusive Dr Snow, there is even less about Marsh. His background was just too humble and his work not famous enough to have left much trace. I turned my attention to finding another narrative that would relegate Marsh to a lesser role but I struggled to find a suitable story to carry me through. Then came the non-fiction writer's worst nightmare: a new book appeared about arsenic in the 19th century. Its sweep was broader than mine and it lacked the strong narrative that I wanted but, even so, it seemed too close for comfort. For a couple of weeks, I was completely disheartened and decided I would have to give up. Then I thought about the court case that had prompted Marsh to develop his test in the first place. He had been asked to analyse some forensic samples as part of a murder investigation and presented his results at the trial of a young man accused of the murder of his grandfather. All accounts of the development of the Marsh test deal with this episode in a couple of sentences, including this latest book that so worried me. I had been planning to devote more space to it - perhaps a chapter - but I had still seen the case very much in the context of telling James Marsh's personal story. I now went to research the crime in detail and uncovered, to my amazement, the most extraordinary murder mystery. The elements included a wealthy, outwardly respectable but dysfunctional family; a father who appeared to be doing his best to have his son hanged; a controversial new will; three main suspects with motive and opportunity; a doctor who turned detective long before the role of detective existed, and a drunken policemen who, sent to collect the evidence, loses half the material in a pub. Even better, there is eventually a wonderful twist in the tail. Here was the vehicle I was looking for, and one that could hardly have been more colourful if I had invented it myself. Some of the official records, particularly those from the coroner's court, hadn't survived, and the records in the National Archives of the trial at Maidstone Assizes are confined to the indictment, verdict and lists of jurors and witnesses. This, however, had been a major national news story of its day. The newspapers covered both the five-day inquest and the two-day trial in huge detail, including the family secrets and scandals that emerged in the courtroom. I was of course able to research the family through the usual sources such as parish records; the births, marriages and deaths register from 1837 onwards; land registration; wills; census returns from 1841 onwards; insurance policies and, relevant in this particular case, criminal records. Even so, handling the structure of the book wasn't entirely straightforward. The chronology proved challenging because some of the important consequences of the Marsh test in terms of forensic science and toxicology happened outside the timeframe of the murder mystery. Yet I was determined to end - à la Hercule Poirot - with the revelation of whodunit in the last few pages, which meant moving back and forth in time while maintaining pace and flow. In this situation the non-fiction writer envies the novelist, able to manipulate events at will, unencumbered by tiresome facts. I, on the other hand, was stuck with writing about what actually happened. How successfully I managed it is obviously for the reader to judge.